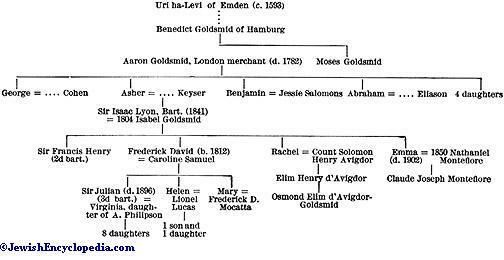 A family of English financiers, who trace descent from a certain Uri ha-Levi of Emden, as shown in the pedigree on opposite page. London merchant and founder of the Goldsmid family of England; born at Amsterdam; died June 3, 1782. He was the son of Benedict Goldsmid, a Hamburg merchant. 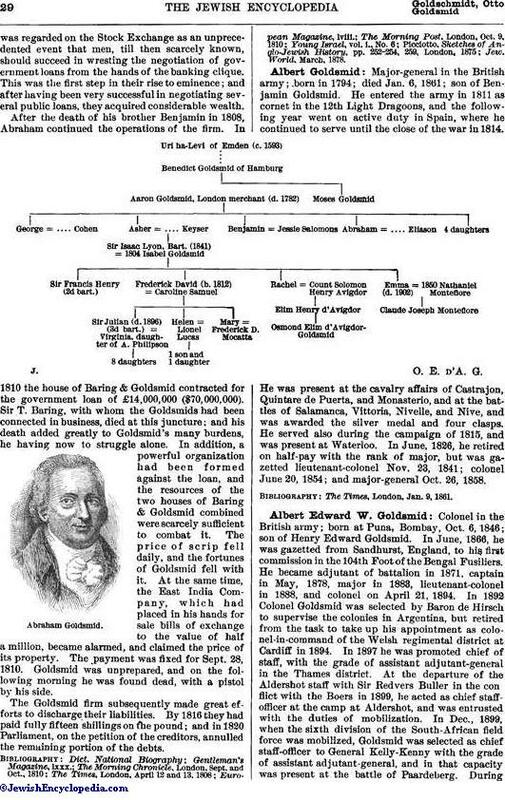 In 1765 he left Holland with his family to settle in London, where he founded the firm of Aaron Goldsmid & Son, subsequently Goldsmid & Eliason. The firm of Aaron Goldsmid & Son experienced serious reverses through the failure of Clifford & Sayer, one of the principal houses in Holland. Hence only George, the eldest son, entered into partnership with his father. The other sons founded new businesses for themselves in which they amassed large fortunes. Goldsmid left four sons and four daughters. The second son, Asher, was one of the founders of the firm Mocatta & Goldsmid, bullion-brokers to the Bank of England. Benjamin and Abraham were famous as financiers and philanthropists. James Picciotto, Sketches of Anglo-Jewish History. English financier and philanthropist; born in Holland in 1756 (? ); died at Morden, near London, Sept. 28, 1810; third son of Aaron Goldsmid. About 1765 he went to England with his father, and soon entered into partnership with his brother, Benjamin Goldsmid, the two starting in business as bill-brokers about 1777. They afterward took a house in Capel street, and soon became successful bidders for the national loan. Itwas regarded on the Stock Exchange as an unprecedented event that men, till then scarcely known, should succeed in wresting the negotiation of government loans from the hands of the banking clique. This was the first step in their rise to eminence; and after having been very successful in negotiating several public loans, they acquired considerable wealth. After the death of his brother Benjamin in 1808, Abraham continued the operations of the firm. In 1810 the house of Baring & Goldsmid contracted for the government loan of £14,000,000 ($70,000,000). Sir T. Baring, with whom the Goldsmids had been connected in business, died at this juncture; and his death added greatly to Goldsmid's many burdens, he having now to struggle alone. In addition, a powerful organization had been formed against the loan, and the resources of the two houses of Baring & Goldsmid combined were scarcely sufficient to combat it. The price of scrip fell daily, and the fortunes of Goldsmid fell with it. At the same time, the East India Company, which had placed in his hands for sale bills of exchange to the value of half a million, became alarmed, and claimed the price of its property. The payment was fixed for Sept. 28, 1810. Goldsmid was unprepared, and on the following morning he was found dead, with a pistol by his side. The Goldsmid firm subsequently made great efforts to discharge their liabilities. By 1816 they had paid fully fifteen shillings on the pound; and in 1820 Parliament, on the petition of the creditors, annulled the remaining portion of the debts. Major-general in the British army; born in 1794; died Jan. 6, 1861; son of Benjamin Goldsmid. He entered the army in 1811 as cornet in the 12th Light Dragoons, and the following year went on active duty in Spain, where he continued to serve until the close of the war in 1814. He was present at the cavalry affairs of Castrajon, Quintare de Puerta, and Monasterio, and at the battles of Salamanca, Vittoria, Nivelle, and Nive, and was awarded the silver medal and four clasps. He served also during the campaign of 1815, and was present at Waterloo. In June, 1826, he retired on half-pay with the rank of major, but was gazetted lieutenant-colonel Nov. 23, 1841; colonel June 20, 1854; and major-general Oct. 26, 1858. The Times, London, Jan. 9, 1861. Colonel in the British army; born at Puna, Bombay, Oct. 6, 1846; son of Henry Edward Goldsmid. In June, 1866, he was gazetted from Sandhurst, England, to his first commission in the 104th Foot of the Bengal Fusiliers. He became adjutant of battalion in 1871, captain in May, 1878, major in 1883, lieutenant-colonel in 1888, and colonel on April 21, 1894. In 1892 Colonel Goldsmid was selected by Baron de Hirsch to supervise the colonies in Argentina, but retired from the task to take up his appointment as colonel-in-command of the Welsh regimental district at Cardiff in 1894. In 1897 he was promoted chief of staff, with the grade of assistant adjutant-general in the Thames district. At the departure of the Aldershot staff with Sir Redvers Buller in the conflict with the Boers in 1899, he acted as chief staff-officer at the camp at Aldershot, and was entrusted with the duties of mobilization. In Dec., 1899, when the sixth division of the South-African field force was mobilized, Goldsmid was selected as chief staff-officer to General Kelly-Kenny with the grade of assistant adjutant-general, and in that capacity was present at the battle of Paardeberg. Duringthe earlier stages of the war he was commandant of the Orange River, Herbert, and Hay districts, 1900. Colonel Goldsmid is an ardent Zionist, and is chief of the Chovevei Zion of Great Britain and Ireland. The success of the Jewish Lads' Brigade in London and the provinces is mainly due to Goldsmid's initiative. In 1903 he became president of the Maccabeans, of which he had been one of the founders. Young Israel, i. No. 10. Writer and communal worker; born in London Sept. 17, 1805; died there Feb. 8, 1889; daughter of Sir Isaac Lyon Goldsmid, Bart. She was a pupil of the poet Thomas Campbell, and translated (1839) into English twelve sermons delivered by Dr. Gotthold Salomon at Hamburg, Ludwig Phillipson's "Die Entwickelung der Religiösen Idee" (1853), and J. Cohen's "Les Déicides" (1872). 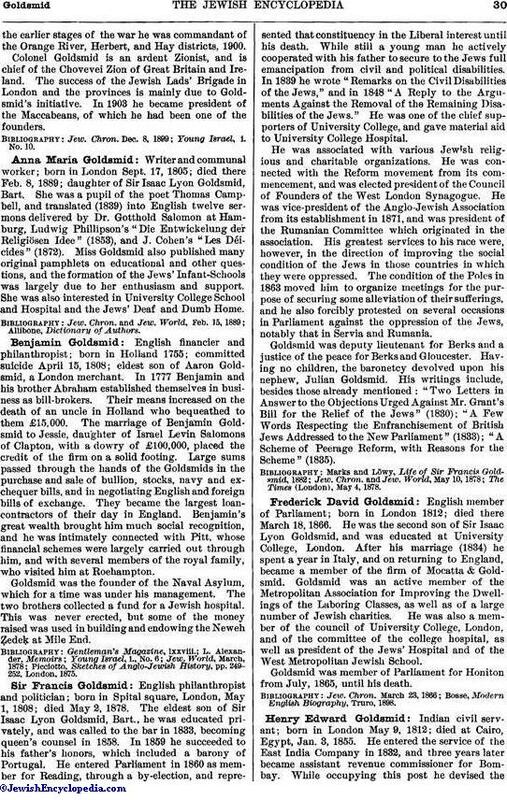 Miss Goldsmid also published many original pamphlets on educational and other questions, and the formation of the Jews' Infant-Schools was largely due to her enthusiasm and support. She was also interested in University College School and Hospital and the Jews' Deaf and Dumb Home. English financier and philanthropist; born in Holland 1755; committed suicide April 15, 1808; eldest son of Aaron Goldsmid, a London merchant. In 1777 Benjamin and his brother Abraham established themselves in business as bill-brokers. Their means increased on the death of an uncle in Holland who bequeathed to them £15,000. The marriage of Benjamin Goldsmid to Jessie, daughter of Israel Levin Salomons of Clapton, with a dowry of £100,000, placed the credit of the firm on a solid footing. Large sums passed through the hands of the Goldsmids in the purchase and sale of bullion, stocks, navy and exchequer bills, and in negotiating English and foreign bills of exchange. They became the largest loancontractors of their day in England. Benjamin's great wealth brought him much social recognition, and he was intimately connected with Pitt, whose financial schemes were largely carried out through him, and with several members of the royal family, who visited him at Rochampton. Goldsmid was the founder of the Naval Asylum, which for a time was under his management. The two brothers collected a fund for a Jewish hospital. This was never erected, but some of the money raised was used in building and endowing the Neweh Ẓedeḳ, at Mile End. Picciotto, Sketches of Anglo-Jewish History, pp. 249-252, London, 1875. English philanthropist and politician; born in Spital square, London, May 1, 1808; died May 2, 1878. The eldest son of Sir Isaac Lyon Goldsmid, Bart., he was educated privately, and was called to the bar in 1833, becoming queen's counsel in 1858. In 1859 he succeeded to his father's honors, which included a barony of Portugal. He entered Parliament in 1860 as member for Reading, through a by-election, and represented that constituency in the Liberal interest until his death. While still a young man he actively cooperated with his father to secure to the Jews full emancipation from civil and political disabilities. In 1839 he wrote "Remarks on the Civil Disabilities of the Jews," and in 1848 "A Reply to the Arguments Against the Removal of the Remaining Disabilities of the Jews." He was one of the chief supporters of University College, and gave material aid to University College Hospital. He was associated with various Jewish religious and charitable organizations. He was connected with the Reform movement from its commencement, and was elected president of the Council of Founders of the West London Synagogue. He was vice-president of the Anglo-Jewish Association from its establishment in 1871, and was president of the Rumanian Committee which originated in the association. His greatest services to his race were, however, in the direction of improving the social condition of the Jews in those countries in which they were oppressed. The condition of the Poles in 1863 moved him to organize meetings for the purpose of securing some alleviation of their sufferings, and he also forcibly protested on several occasions in Parliament against the oppression of the Jews, notably that in Servia and Rumania. Goldsmid was deputy lieutenant for Berks and a justice of the peace for Berks and Gloucester. Having no children, the baronetcy devolved upon his nephew, Julian Goldsmid. His writings include, besides those already mentioned: "Two Letters in Answer to the Objections Urged Against Mr. Grant's Bill for the Relief of the Jews" (1830); "A Few Words Respecting the Enfranchisement of British Jews Addressed to the New Parliament" (1833); "A Scheme of Peerage Reform, with Reasons for the Scheme" (1835). The Times (London), May 4, 1878. English member of Parliament; born in London 1812; died there March 18, 1866. He was the second son of Sir Isaac Lyon Goldsmid, and was educated at University College, London. After his marriage (1834) he spent a year in Italy, and on returning to England, became a member of the firm of Mocatta & Goldsmid. Goldsmid was an active member of the Metropolitan Association for Improving the Dwellings of the Laboring Classes, as well as of a large number of Jewish charities. He was also a member of the council of University College, London, and of the committee of the college hospital, as well as president of the Jews' Hospital and of the West Metropolitan Jewish School. Goldsmid was member of Parliament for Honiton from July, 1865, until his death. Boase, Modern English Biography, Truro, 1898. Indian civil servant; born in London May 9, 1812; died at Cairo, Egypt, Jan. 3, 1855. He entered the service of the East India Company in 1832, and three years later became assistant revenue commissioner for Bombay. While occupying this post he devised therevenue survey and assessment system, Puna being included in its organization. "Goldsmid's Survey," as it was called, was a great boon to the poor agriculturists of the presidency; and it was permanently established by the Bombay legislature in 1865. It was incorporated in the Bombay revenue code of 1879, and was also adopted by the Berars and the native state of Mysore. Goldsmid's health broke down owing to his incessant labors; and after holding the positions of private secretary and chief secretary to the governor of Bombay, he went to Cairo, where he died. Ten years later a memorial rest-house was erected by public subscription at Decksal, near the place where Goldsmid's survey had commenced. Young Israel, i., No. 10. English financier and the first Jewish baronet; born in London Jan. 13, 1778; died there April 27, 1859. He was the son of Asher Goldsmid, and nephew of Benjamin and Abraham Goldsmid, the financiers. Educated at an English school in Finsbury square, he received a sound financial training in the technicalities of his father's business of bullion-broking. At a later period his association with Ricardo made him familiar with the leading questions of political science. He became in due course a partner in the firm of Mocatta & Goldsmid, bullion-brokers to the Bank of England and to the East India Company. His early ventures on the Stock Exchange were unfortunate, and, after losing on one occasion £16,000, he abandoned speculation and contented himself with steady business as a jobber. Goldsmid gradually rose to eminence as a financier, and ultimately amassed a large fortune. His most extensive financial operations were connected with Portugal, Brazil, and Turkey; and for his services in settling an intricate monetary dispute between Portugal and Brazil he was, in 1846, created Baron de Palmeira by the Portuguese government. Goldsmid was one of the founders of the London Docks. The main effort of his life was made in the cause of Jewish emancipation. He was the first English Jew who took up the question, and he enlisted in its advocacy the leading Whig statesmen of the time. Soon after the passing of the Act of 1829, which removed the civil disabilities of the Roman Catholics, he secured the powerful aid of Lord Holland, the Marquis of Lansdowne, the Duke of Sussex, and other eminent members of the Liberal party, and then induced Robert Grant to introduce in the House of Commons a similar measure for the Jews. During more than two years from the time when Jewish emancipation was first debated in Parliament, Goldsmid gave little heed to his ordinary business, devoting himself almost exclusively to the advancement of the cause. He was one of the chief agents in the establishment of University College, London, purchasing at his own risk the site of the university. 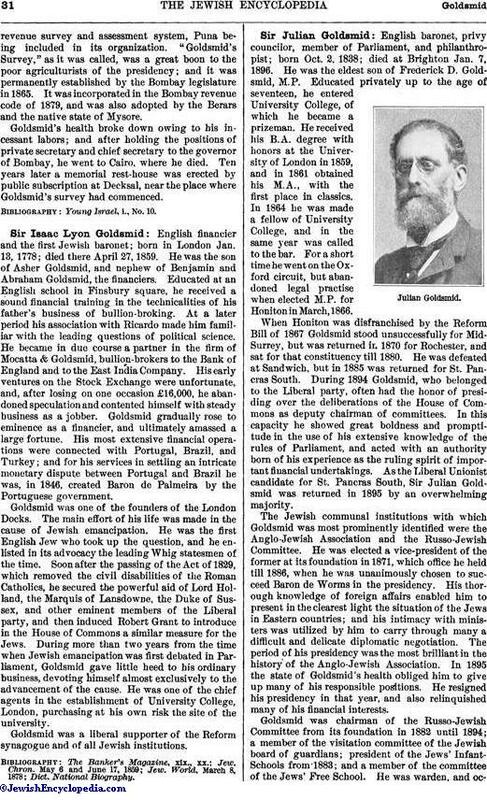 Goldsmid was a liberal supporter of the Reform synagogue and of all Jewish institutions. English baronet, privy councilor, member of Parliament, and philanthropist; born Oct. 2, 1838; died at Brighton Jan. 7, 1896. He was the eldest son of Frederick D. Goldsmid, M.P. Educated privately up to the age of seventeen, he entered University College, of which he became a prizeman. He received his B.A. degree with honors at the University of London in 1859, and in 1861 obtained his M.A., with the first place in classics. In 1864 he was made a fellow of University College, and in the same year was called to the bar. For a short time he went on the Oxford circuit, but abandoned legal practise when elected M.P. for Honiton in March, 1866. When Honiton was disfranchised by the Reform Bill of 1867 Goldsmid stood unsuccessfully for Mid-Surrey, but was returned in 1870 for Rochester, and sat for that constituency till 1880. He was defeated at Sandwich, but in 1885 was returned for St. Pancras South. During 1894 Goldsmid, who belonged to the Liberal party, often had the honor of presiding over the deliberations of the House of Commons as deputy chairman of committees. In this capacity he showed great boldness and promptitude in the use of his extensive knowledge of the rules of Parliament, and acted with an authority born of his experience as the ruling spirit of important financial undertakings. As the Liberal Unionist candidate for St. Pancras South, Sir Julian Goldsmid was returned in 1895 by an overwhelming majority. The Jewish communal institutions with which Goldsmid was most prominently identified were the Anglo-Jewish Association and the Russo-Jewish Committee. He was elected a vice-president of the former at its foundation in 1871, which office he held till 1886, when he was unanimously chosen to succeed Baron de Worms in the presidency. His thorough knowledge of foreign affairs enabled him to present in the clearest light the situation of the Jews in Eastern countries; and his intimacy with ministers was utilized by him to carry through many a difficult and delicate diplomatic negotiation. The period of his presidency was the most brilliant in the history of the Anglo-Jewish Association. In 1895 the state of Goldsmid's health obliged him to give up many of his responsible positions. He resigned his presidency in that year, and also relinquished many of his financial interests. 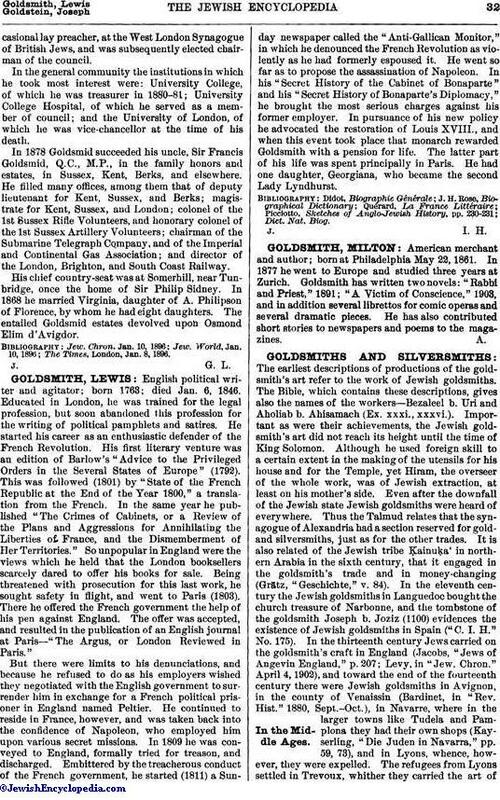 Goldsmid was chairman of the Russo-Jewish Committee from its foundation in 1882 until 1894; a member of the visitation committee of the Jewish board of guardians; president of the Jews' Infant-Schools from 1883; and a member of the committee of the Jews' Free School. He was warden, and occasionallay preacher, at the West London Synagogue of British Jews, and was subsequently elected chairman of the council. In the general community the institutions in which he took most interest were: University College, of which he was treasurer in 1880-81; University College Hospital, of which he served as a member of council; and the University of London, of which he was vice-chancellor at the time of his death. 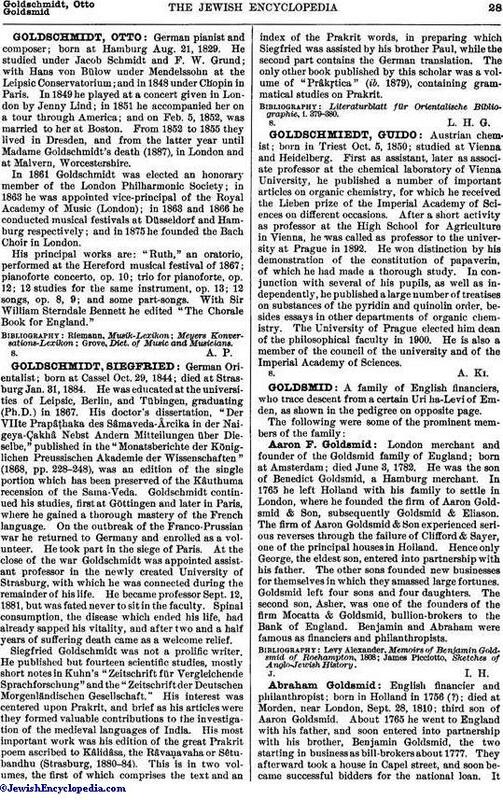 In 1878 Goldsmid succeeded his uncle, Sir Francis Goldsmid, Q.C., M.P., in the family honors and estates, in Sussex, Kent, Berks, and elsewhere. He filled many offices, among them that of deputy lieutenant for Kent, Sussex, and Berks; magistrate for Kent, Sussex, and London; colonel of the 1st Sussex Rifle Volunteers, and honorary colonel of the 1st Sussex Artillery Volunteers; chairman of the Submarine Telegraph Company, and of the Imperial and Continental Gas Association; and director of the London, Brighton, and South Coast Railway. His chief country-seat was at Somerhill, near Tunbridge, once the home of Sir Philip Sidney. In 1868 he married Virginia, daughter of A. Philipson of Florence, by whom he had eight daughters. The entailed Goldsmid estates devolved upon Osmond Elim d'Avigdor. The Times, London, Jan. 8, 1896.